Recently, a new site has started which is a platform for video debates on various controversial issues. The owner of the site finds persons on Facebook who are active in discussing the matter, and sets up an hour-long debate which then will be uploaded to You Tube so that others can watch it after it is over. One of the topics is Syria. Originally, the title of the room where those debates take place was “Civil War In Syria” and the photo that accompanies it is of Assad and some of his high-ranking officers. Today, the photo still is there, but the title reads “Revolution in Syria”. I suppose this must be a compromise for each of the factions. I had been invited to debate by the owner of the site, and participated in my first discussion. Then I was invited to participate in another one, but during it, after 45 minutes, the opponent declared he was having some internet problems, was not satisfied with the audio and he did not want what we recorded uploaded but wanted a new debate the next week. We both agreed and it was rescheduled. We had the debate, which you can watch here, to make all the judgments for yourselves on how it unfolded. A few days later, Ghassan continued the private message between the site owner and me, addressing me alone and asking for a “re-match”. I wrote that I do not schedule the debates, so he would have to talk to the owner about it. A LONG discussion ensued, and within this conversation, you will see EXACTLY how the Pro-Assad faction twists facts even when it is in front of their eyes, all in a day’s work! Therefore, for your entertainment and information, see for yourselves the mechanisms of the Pro Assad side, how facts and truth, even with evidence in front of their eyes, get distorted and twisted. Hi Guys. Can we reschedule this for same time next week? Hey Ghassan and Mary are we still all good for a Vonvo discussion this Sunday at 4PM EST which is 10PM for you Mary and 9PM for you Ghassan….?? that would be 11 PM for Lebanon, no? or 9 in Rome and 10 in Lebanon, correct? 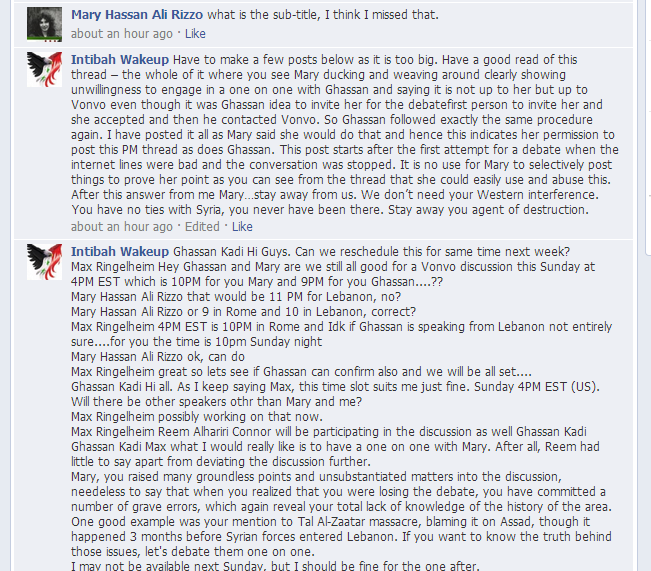 great so lets see if Ghassan can confirm also and we will be all set…. Hi all. As I keep saying Max, this time slot suits me just fine. Sunday 4PM EST (US). Will there be other speakers othr than Mary and me? possibly working on that now. Max what I would really like is to have a one on one with Mary. After all, Reem had little to say apart from deviating the discussion further. Mary, you raised many groundless points and unsubstantiated matters into the discussion, needeless to say that when you realized that you were losing the debate, you have committed a number of grave errors, which again reveal your total lack of knowledge of the history of the area. One good example was your mention to Tal Al-Zaatar massacre, blaming it on Assad, though it happened 3 months before Syrian forces entered Lebanon. If you want to know the truth behind those issues, let’s debate them one on one. I may not be available next Sunday, but I should be fine for the one after. odd, i Never for one second thought I was losing the debate! I am not here to attack your ego Mary and/or give it the tap on the shoulder. The question is that though you have little to say, the setting of the first failed discussion we had and the time allocations we had in the 2nd discussion, you accused me of not answering your questions. I want to answer your questions, though I normally do not get into details. This is your call Max. Ghassan, i don’t think you GET IT! it is not about you or me, no matter how many times you wish to deflect the discourse into a “personal direction”, without EVER revealing where you actually come from, what you do, who you are. For god’s sake, you do not show your face or give your real name, and yet you spend time to provide your assessments of your opponents as if from atop some pulpit! it is about you going continually off the topic and rather than debate the current issues that might actually interest people, you want to provide your version of a history lesson with the “Defiant Narrative”. It is clear that this is the sole argument that you have, and in all sincerity, it has been adequately responded to by Reem and myself. Mary, on one hand you accuse me of taking a “personal direction” and then you put my identity/location etc… as important issues. I wonder if you see the contradiction. The reason I “hide” myself is to avert danger. I have just received the news that a cousin of mine got killed in the Homs region for similar reasons, and I do not intend to take this path, at least not deliberately. As I said to you in the interview Mary, I know that you are well-intentioned, by very highly misled, and your work is causing harm to my country and I am prepared to do all that is in my power to change the minds of people like yourself because it is the combined efforts of the pro rebelion who want to bring in NATO no flight zone (and we know what this meant in Lybia). We just want the world to get its hands off Syria, and you would be doing the same if the whole world was conspiring to drag Italy into oblivion. If you are prepared to take the “challenge”, then you are welcome, and if you don’t, it would be entirely your decision to be seen as running and hiding. This is not about inflaming your ego and persuading you into a debate, but I just feel that somehow we perhaps “need” to end this debate, albeit in agreeing to disagree, and not by leaving certain issues un-discussed. you have some issues, dear Ghassan, and one of them is your insistence on interpreting the intentions/sentiments of your adversaries simply by projecting your own ideas. When someone “loses” a debate or any sort of challenge, they traditionally are in the position of asking for a rematch. This is clear around the entire world, and while you are convinced that I was fretting because of losing, despite my expressing to you that I did not feel for one moment that either Reem or I were “losing”, quite the opposite in fact! You lost your temper and demanded double time, went emotionally over the edge when “interrupted”, yet insisted that you yourself could continue to interrupt. I do not consider you a debate partner that respects those you are in the conversation with, and find that you have a tendency to gatekeep that inhibits free discourse, which is why I am obligated to point it out to you and to anyone listening. I am not asking for a re-match. I am challenging you to finish what we have started. There is a great difference. If you are so confident that you have won the debate, should be looking forward to “smash” me some more, so what are you so worried about ? i am worried about nothing. You seem to fancy yourself as some sort of guru, this I find frankly kind of comical, and the way you dismissed the ONLY syrian on the discussion is evidence enough that you do not LISTEN, but you simply pummel your own narrative. You have asked for a rematch, and I don’t see any ground rules to make certain you keep civil and do not break out shouting or to keep the argument on the topic rather than veering off into tangents. Your psychoanalysis of me Mary does not intimidate me. You are simply worried to continue and you are too scared to go one on one. Plain and simple. And BTW, I am Syrian too. As Lebanese, I am a Syrian whether colonialists define me this way or not. I am not psychoanalysing you, nor am I intimidating you. You seem to have great difficulty reading or listening to what others write or state without projecting something on top of that, as well as “describing” their mental state or their emotions. This is something that you could work on if you wish to continue to debate others as an equal! Mary please let us cut this out. It is psychoanalysis of some sorts. Let us not split hairs please. The bottom line is what matters. Do you want to finish this discussion on one-on-one basis? Yes or no. Given that you have dragged Max into this, NOT without reason – on the contrary, in an effort to exert some pressure on me and given that Max has said no word at all (rightfully, he is just the “organiser/moderator”), throwing the ball in my court isn’t working, as I’m not a kid and I don’t see things as personal challenges, where I have to be proven the ‘winner’ of anything. Whether we agree on what is happening in Syria or not, the fact that remains and we both agree on is that people are being killed (regardless whose side they’re on) and when the factor ‘human life’ enters, I don’t play games by accepting or declining challenges. My points of view are clear, whoever likes them, fine, whoever doesn’t like them, that’s again fine. I feel confident about myself and I feel confident that I’m on the right side of history and I’d be more than happy to express my views, whenever I’m invited to do so, either on a public forum like vonvo or in other venues. If the organisers/moderators of Vonvo wish to arrange for a discussion about Syria and if THEY want to invite me, I’d be more than glad to participate. My participation is NOT subject to who the other participants are, but rather the topic. I have been invited by Vonvo twice and accepted the invitation, however it is not me who has asked for these debates to take place. It was the other way around. Vonvo decides, they organise them, they are the ones who reached me and I accepted. Therefore, kindly refrain yourself from writing around on FB that you are challenging me for another debate and I’m playing “tough” because you know very well that this is not the case and remember my Dear Ghassan, that I never speak without proof and I remind you of the famous quote “verba volant, scripta manent”. For the last time, please stop sending me PMs asking me for another debate. It is not up to me. I have proven that I have no problem whatsoever to participate with anyone in discussions, therefore my actions speak louder than words. If Vonvo decides to have another debate and if they want me to be one of the speakers, I’m more than happy to hear from THEM and if I’m available on the scheduled date/time, then I’ll accept their invitation. I however will expose attempts at gatekeeping, will be less tolerant of rudeness and sudden attempts to modify the rules by any of the participants, and any “opponent” should bear in mind that rules do not get created during an encounter, such as double time allotments and the permission of one party to interrupt but the other parties must wait five minutes and at times more, when the discussion has taken different tangents. It is clear that you are avoiding a one on one debate. I don’t blame you. Ghassan, it’s not necessary to continue to persevere with analysis of my motivations and mental state, as you are entirely off the track, and no matter what I would say, you would persist in your own expression of patently erroneous statements! Ghassan, I have debated persons for YEARS and chaired panels where there were actually adversaries who were much more “threatening” than you are. I have also debated in other venues and even on vonvo before, so I don’t understand why you insist you are extending some kind of rematch to me, who you erroneously persist in considering as “me avoiding you”. You are not the issue. I debate about Syria, you are totally irrelevant to any participation of mine in a debate about Syria, though you seem to be keen on it with great persistence. Should I feel “honoured”? I also do not realise that you are the one who is creating the schedule / programming for vonvo. 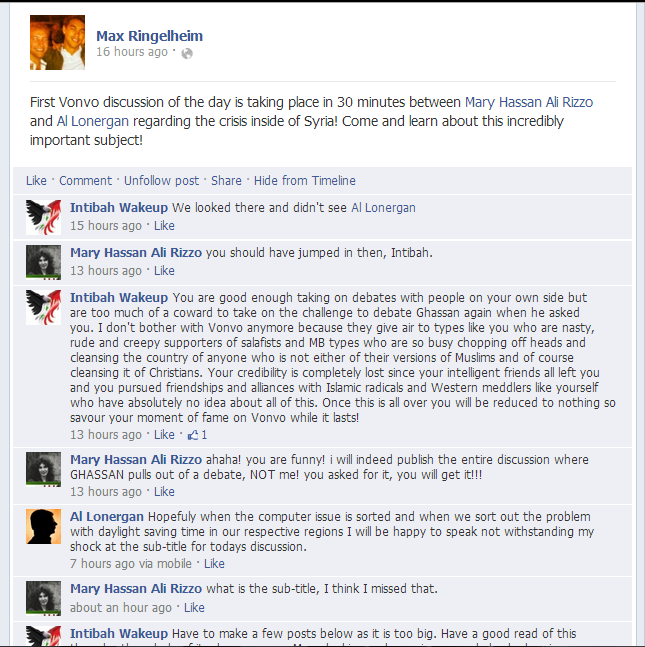 I had been invited by Max weeks ago, and when he had asked me if i wanted to debate Syria, I accepted. You asked me if i wanted to debate you, and i said, if memory serves, why not. I have no particular issue with you, I “ended” interaction with you when i felt spammed and when you began to attack me, which is something everyone does when they no longer seek interaction with someone on FB, they unfriend them! As I also remember, a close friend of yours was insulting me for “being a Jew”, and your wife spammed my inbox unsolicited. If anything, i have been tolerating your attitude – which clearly showed your limits not only in discourse, but in tolerating that anyone has the opportunity to speak, including the insertion of ad hominem speech, interrupting both Reem and me repeatedly but screaming and telling us to shut up when we asked for you to repeat something or when we in real time said something was untrue when you were stating something entirely invented. As for changing the rules during the debate, I think this demand you made during the debate to have double time to either of your adversaries reveals your own weaknesses while alotting you a privileged position in the debate. Insistence upon obtaining the last word, double intervention, avoidance of the points raised by your adversaries, refusal to take a question from the moderator and derailing of the discourse into tangents that also included discussion of the parties involved does not quite strike me as civil conduct! I imagine that in all future debates, Max will have to consider that rules do not get amended while a debate is in course, and since it was clear that there was the panel composition, this should not have happened during the debate. Your being satisfied with your privilege and demanding it be respected outside of the original “pact” resulted in you raising your voice in continuation and demanding others to be cut short. So, I honestly do not get your point in responding when it is made clear that your request for a rematch does not depend upon you or me. There are many persons who I am certain are anxious to debate about the topic, and unless the ground rules are fair and you are kept to maintain civil composure, you must have the humility at least to recognise that it is not your decision or my decision to make, so you can even keep your attitude problems under cover and at least appear a bit more of a gentleman! You are simply, though vet elaborately, trying to avoid finishing the discussion because you well know that if you did, your lack of knoewledge will be exposed and you will lose your popularity among your followers who were littering the chat room with silly comments and personal attacks. That’s fine Mary. I won’t twist your arms. You have distanced many friends recently simply because you have no arguments to make. I just would wish that you would stop meddling into my country. You are causing harm and you are not at all helping anything or any one except the friends of Israel. Speaking of whom, you did not respond to my comments regarding FSA fighters getting treated in Israeli hospitals. These are the questions you are trying to avoid confronting. But this is fine Mary. I will not defame you in FB as you. You have already made some recent complaints to FB. I do have the right however to say that you are refusing to finish the debate. Guys I will try reading through this fully and respond to this a little later. Been a busy busy day today. While you are at it Max, please make it clear who has broken the debate protocol and who interrupted who. I interrupted Mary once only and said “I need to interrupt”. She interrupted me on a number of counts. Further, her supporters mobbed the chat room. I believe that the same rules of civil conduct that apply to the debate room should apply to the chat room. Mary has accused me (above) of the exact things that she and her groupies have done, but bullies often play victims. There is nothing new in this tactic. Honestly, this needs to be tidied up. I know that Vonvo is not CNN, but there are certain basic rules that need to be implemented. Least of which is that the number of people in the debate room should be raised to 5 so you can have yourselv plus 2 from each side. It seems that either your English isn’t good enough or you have reading comprehesion problems, because I can’t explain otherwise what it is that you don’t understand when I say “don’t contact me with regards to another vonvo debate, it’s not up to me, it’s up to them”. Anyhow, it looks like you just want to have the last word, regardless if what you say is true or not. So, listen to me and this time try to understand what I’m saying because enough is enough. You can claim as much as you like that I’m avoiding/declining/rejecting your proposal/suggestion/challenge for another debate. If you wish, you can also claim that the earth is square and not round. You can also claim that Elvis is still alive. Whatever it is you claim, I advise you to not forget that the evidence proving the contrary is here and I will put it out if you decide to continue acting like a 5 year old in kindergarten. So, here’s the deal. I’ll repeat it for the last time – take it or leave it. It’s up to you. As I have made it crystal in this PM that I have no problem whatsoever to engage in another vonvo debate with you (or anyone else for that matter), try your best to understand and realise that I’m not the person in charge for organising these debates. Max is. So, quit barking up the wrong tree. If you don’t know the meaning of that idiom, you can also take it literally! With regards to your allegation that I’m going around on FB defaming you or whatever, I refer you to last night’s thread that your wife started in your group, in which she claims that I have reported her on FB about some comment in some thread, which I have no idea whatsoever about. However, what I’m certain though is that this thread contains enough comments that are pure lies, let alone the various derogatory and insulting terms used, like for example the Spanish ‘puta’, i.e whore. Who is libeling whom on FB is clear. It’s obvious that you have turned this to a personal issue and that Syria is the last thing you actually want to discuss. Moreover, you have dragged Max & Vonvo into a vendetta (note: a vendetta that takes place only in your mind and imagination) by asking him the most absurd stuff and requesting him to act as a mediator, as if this is his job. And when he declined to do so, simply because he’s only the Vonvo moderator and not your Mother or Father where you can go to and complain that some child stole your chocolate bar, asking him to do things that are none of his business, like taking actions against anyone who writes anything on FB. That is not his business, nor his job and for all I know, he couldn’t care less if a bunch of people on FB wish to engage in petty cat-fights. The guy only wants (and rightfully so) to acquire more speakers & listeners for a project he started, namely Vonvo. It’s not his job to take sides or tell people what to write and what not on FB and when he made that clear to you guys last night, your first reaction was to immediately dismiss Vonvo, start calling for people to leave Vonvo and start accusing them of a bunch of things. Thumbs up! Score! For the love of God people, grow up! Listen Ghasan, and if you don’t understand what I’m going to say then reread it as many times as you need until you get it. I don’t care how Max will deal with your actions and your group’s posts & comments on FB dissing Vonvo. That is his job to do and he will deal with it accordingly if he wishes and if he thinks it’s necessary, in an effort to protect Vonvo from libel. But when it comes to me, rest assured that the next time you will write to me with false allegations and lies or you, together with your friends, write again anywhere that I’m declining your proposal or call me a whore again, I will put out in the public this PM, as well as any other threads which clearly prove that what you claim is false. End of story. I’m sorry that you have been involved in this silliness but unfortunately this is the ugly side of activism. I trust your judgement and I trust that you will deal accordingly with whatever defamatory comments have been put and will be put up on FB in the future about Vonvo, simply because you chose not to be part of an argument that doesn’t involve you. As I said yesterday Max, if you wish to organise another debate on Vonvo and invite me as a speaker and given that I’m available, please feel free to contact me. You know where to find me. I apologise for you being put in the middle but I can’t control other people’s actions nor can I prevent anyone from copying you in PMs that don’t concern you. It’s clear though, that you being included in such an exchange of messages was not my decision nor was it ever my wish, as I can realise that you are just a moderator of a public forum. I’ve been trying for 2 days now to make Ghassan understand that, it seems that he’s not capable of understanding it though. I hope that you will soon be left out of the drama that some people instigate and that you won’t have to deal with a defamatory campaign against Vonvo. Hey guys so I hear both of your points and respect each of you. I also thoroughly enjoy and appreciate the time that you have devoted to the Vonvo website. Ultimately I think you both believe in Vonvo and its mission of fostering discussion and debates around crucial trending current events. Our platform is unfortunately not perfect but enhancements to our Version 2 Vonvo website should be coming in the following weeks. In the end when you break this down, very simply in my eyes this just seems like a matter where two people having differing opinions and are struggling to find common ground and agreement. This is MORE than fine! Vonvo cant guarantee people will agree with one another but the point is providing a platform where one can be heard. I have practically no control over what people can do off of the Vonvo website which I think you would both find understandable. Max. Mary follows the strategies and tactis of Israel. Attack, lie, frame others, and then play victim. Her very rude remarks above are very obvious and she is trying to make herself look nice towards you just for the sake of trying to me make me look bad. I do not wish to debate her any more. I would rather debate someone else who is decent and has something of substance to say. no problem Ghassan thank u for your suggestion and that is more than fine. ALL GOOD. Have a good weekend and just to confirm u said u are not available correct? Yes. This weekend shoud be fine. Thank you both Mary and reem, this video is great evidence in the face of any defender of the genocide regime of Assad. From the beginning instead of introducing himself this creature he chose to attack and to prove how much he is ignorant. Actually the Syrians and Palestinians struggle have very clear thing in common both on one level are a matter of equality and human lives, reem eloquently said it. Ghassan said: no matter how far Assad regime go, still there is no comparison between the two, this stupid head, is 70,000 documented killed is not enough for him, 4 million refugees is not enough for him, let him go and find out how many killed in 60 years by Jewish state and how much by Assad. Is he that dumb.